Fasting is a period for an abased soul before God through repentance, tears and humility. Thus one becomes aware of its weakness, knows that he is form dust and ashes and appeals to the Higher Power. When the body is humbled by hunger, the soul too is humbled. Thus, it humbles itself while it bows down before God in obedience and humility confessing its sins. Humility softens the heart of God and all the dwellers of Heaven. In his humility and weakness, man renounces all. His heart is no longer attached to any wordily lusts and he addresses God in a profound manner. The Holy Bible presents us with several examples of self-abasement in fasting since God cannot bear to see the humility of His children before Him. Examples abound in the Book of Judges where God saw the humility of His people, descended, and saved them. (Judges 2). “In all their affliction He was afflicted, And the Angel of His Presence saved them.” (Is 63:9). Through self-abasement and defeat, the people become humble and the Lord comes need those who are humbled and to those with a crushed heart and He saves them. The fast that the Prophet Joel ordered is a clear example: He said: “Gird yourselves and lament, you priests; … Come, lie all night in sackcloth, You who minister to my God; … Consecrate a fast, Call a sacred assembly. “ (Joel l:13,14) “Now, therefore," says the Lord, "Turn to Me with all your heart, … Consecrate a fast, Call a sacred assembly … Let the bridegroom go out from his chamber, And the bride from her dressing room. Let the priests, who minister to the Lord, Weep between the porch and the altar; Let them say, "Spare Your people, O Lord, And do not give Your heritage to reproach, That the nations should rule over them. Why should they say among the peoples, `Where is their God?' “ (Joel 2:12-17). Here we see details of a integral fast. Fasting, together with repentance (returning to God), prayer, self abasement, weeping, lamentation, shunning bodily desires, seclusion are all elements of fasting and no longer becomes mere abstention from food. Another example is the fast of the people of Nineveh. All the people, even children and babies, fasted and neither ate nor drank anything, and we have discussed this issue before here on st-takla.org in other pages. They did not stop at that but humbled themselves before God, covering themselves with sackcloth and ashes. Even the King himself removed his crown and royal attire, did not sit on his throne but sat with the people on sackcloth and in ashes and they all cried mightily unto God. (Jon 3). Such also was the fast of Nehemiah and that of Ezra. 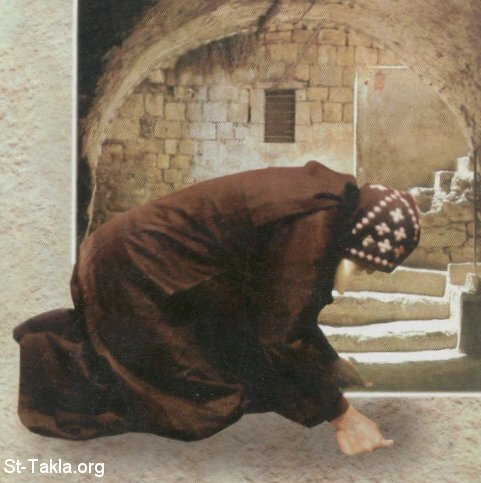 Ezra, the scribe and priest, said: “Then I proclaimed a fast there at the river of Ahava, that we might humble ourselves before our God, to seek from Him the right way for us and our little ones … So we fasted and entreated our God for this, and He answered our prayer.” (Ezra 8:21,23). Nehemiah also said: “I sat down and wept, and mourned for many days; I was fasting and praying before the God of heaven.” (Neh 1:4). He said this about himself, but as for the people, he said that they “were assembled with fasting, in sackcloth, and with dust on their heads. Then those of Israelite lineage separated themselves from all foreigners; and they stood and confessed their sins and the iniquities of their fathers. And they stood up in their place and read from the Book of the Law of the Lord their God for one-fourth of the day; and for another fourth they confessed and worshiped the Lord their God.” (Neh 9:1-3). Is this not also an integrated fast: through prayer, weeping, lamentation, Bible reading, repentance, confession, and abasing oneself in sackcloth and ash! Therefore, fasting is not merely abstention from food. In the same way was the Prophet Daniel's fast. He said: “Then I set my face toward the Lord God to make request by prayer and supplications, with fasting, sackcloth, and ashes. And I prayed to the Lord my God, and made confession … "we have sinned and committed iniquity, we have done wickedly and rebelled, even by departing from Your precepts …” (Dan 9:3-5). In another fast, he says: “I, Daniel, was mourning three full weeks. I ate no pleasant food, no meat or wine came into my mouth, nor did I anoint myself … “ (Dan 10:2,3). This fast constitutes the same elements as the previous fasts. This is indeed the fast that the Prophet David referred to, saying: “My clothing was sackcloth; I humbled myself with fasting “ (Ps 35:13). There is no doubt that lamentation constrains the bodily lusts and removes all desire for food. Moreover, humility opens the gates of Heaven.